EDF Energy's lifetime strategy is to seek life extensions for all its nuclear stations, where it is safe and commercially viable. Our life extension programme approach ensures that safety always remains at the forefront through significant additional investment to secure long term safety margins. 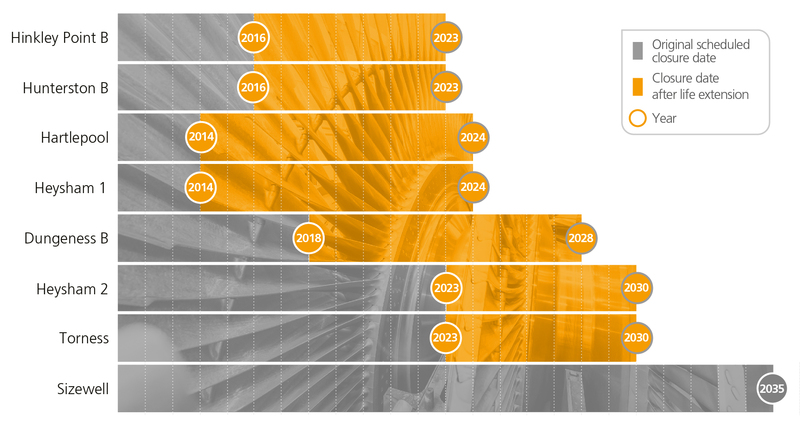 Since 2008 we have added an average of over eight years to the expected closure date of our Advanced Gas-cooled Reactor (AGR) fleet; without these extensions, four stations (eight reactors) would have closed, depriving the UK of much needed low carbon electricity. Can we do it? Is it technically possible? Should we do it? Will the benefits outweigh the investment? Is it acceptable to do it? What are the environmental and UK economic benefits? The lifetime challenges for AGR plant centre on irreplaceable components such as the graphite core and boilers - that are subject to an operating environment of high temperatures, pressures and radiation. Our extensive research and development programme inform our decisions relating to the lifetime of the plants, by improving understanding and reducing uncertainty in potentially life-limiting systems. Our confidence to justify safe and reliable operations over extended life comes from a strong and deep understanding of these systems. At the heart of our advanced gas-cooled reactors (AGR) is the graphite core which acts as a moderator, reducing the speed of neutrons and allowing a nuclear reaction to be sustained. Each of our AGR power stations has a number of boilers which transfer the heat from the reactor core to water, producing the steam required to drive the turbines and produce electricity.